Seriously Why Is Tesla’s Elon Musk Still Selling Flamethrowers? Elon Musk is no stranger to media fanfare and making grandiose claims. The entire story of his underground tunnel operation, the cheekily-named Boring Company, stems from a day when Musk was sitting in Los Angeles traffic marveling at how bad the city’s infrastructure is. The story goes that he surveyed the gridlock on the spider web of freeways surrounding downtown L.A. and decided that he could invent tunnel-boring machines and design an underground network of subways that would solve the city’s traffic problems. And so far, The Boring Company actually has completed preliminary tunnel digging beneath the city. So how did we go from underground tunnels to flamethrowers? Why is the Tesla and SpaceX mad scientist offering flamethrowers for sale? Here’s a look at what Musk is thinking. So, the idea of an egotistical tech billionaire–known for his impossibly big ideas that (mostly) come to fruition–declaring that he can solve a city’s infamous traffic problem is already absurd enough. It’s hard to decide what makes it more absurd: the name or the fact that the company has actually secured permission to dig two miles of test tunnel under parts of the Los Angeles area. That alone should be headline-generating news. Digging a tunnel underneath a developed metropolitan area is a huge deal, especially for an upstart company looking to “disrupt” the infrastructure industry. 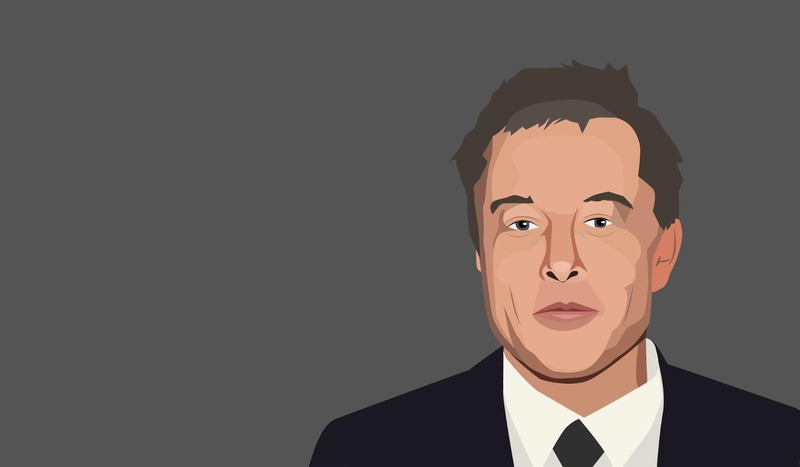 But Musk has done more than disrupt industry itself; he’s used his celebrity status to earn public favor and even crowdfund what are essentially kitschy and ambitious forays into uncharted territory. The first effort? Selling decidedly normcore hats with the project’s tongue-in-cheek name emblazoned on the front. The hats, which sold for $20 each and were ‘capped’ at 50,000 units, raised $1 million dollars for The Boring Company, generating a bit of a self-fulfilling advertising and fundraising campaign, with Silicon Valley cognoscenti rocking the ridiculous headwear in various layers of irony and jocuseriousness. Musk used his massive social media presence as further free advertising, occasionally chiming in on Twitter to create a sense of connectivity and fanfare around the hats. So imagine the internet’s reaction when the flamethrower debuted. The name alone generates giggles and whispers. Say the word “flamethrower” and virtually everyone envisions something from the flamethrowers used in World Wars 1 and 2 to some sort of sci-fi hero fighting off enemies or dragons with a giant, flame-belching weapon. 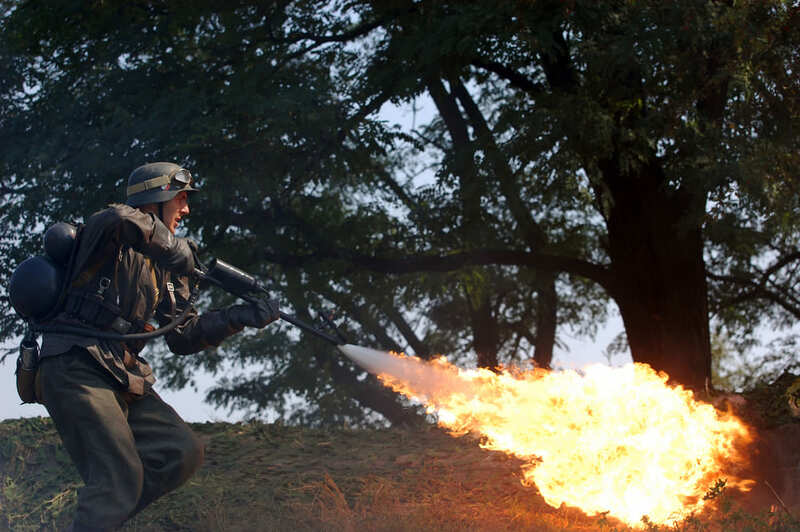 The reality is that most modern-day flamethrowers are used for decidedly less interesting (and violent) endeavors like invasive species control, controlled burns, and similar agricultural and industrial pursuits. Plenty of commercial equipment supply companies sell them. But they weren’t on anybody’s radar until Mr. Musk himself announced that The Boring Company’s follow up limited edition product would be a flamethrower that the general public (read: internetty fanboys who think everything Musk touches turns to gold) began to froth over the prospect of buying a flame-spitting toy. It’s not that flamethrowers have anything specific to do with boring underground tunnels (aside from a vague 1980’s industrial-chic thing that Musk is clearly a fan of) or that the buyers of the hats or flamethrowers will ever use their branded products to assist the creation of an ambitious underground tunnel system in Los Angeles (and Baltimore and Chicago, and anywhere else Musk has hinted at wanting to bore beneath). Sure, the purchase of overpriced ironic products hawked by Musk funds these endeavors in some small way, but Elon Musk has never been shy to spend his ample fortunes on passion projects. Instead, there is something commoditized about the overall Boring Company brand that Musk is trying to perpetuate. Is it marketing? Earning public favor for endeavors that are clearly mired in bureaucratic red tape and skepticism? Simply another ego-stroking semi-serious endeavor in a long list of them? In short, the plan is indeed to leverage the gimmicky-but-very-real devices to generate public interest and bankroll further lawyering and lobbying required to secure approval of the experimental tunnel digging The Boring Company is interested in. 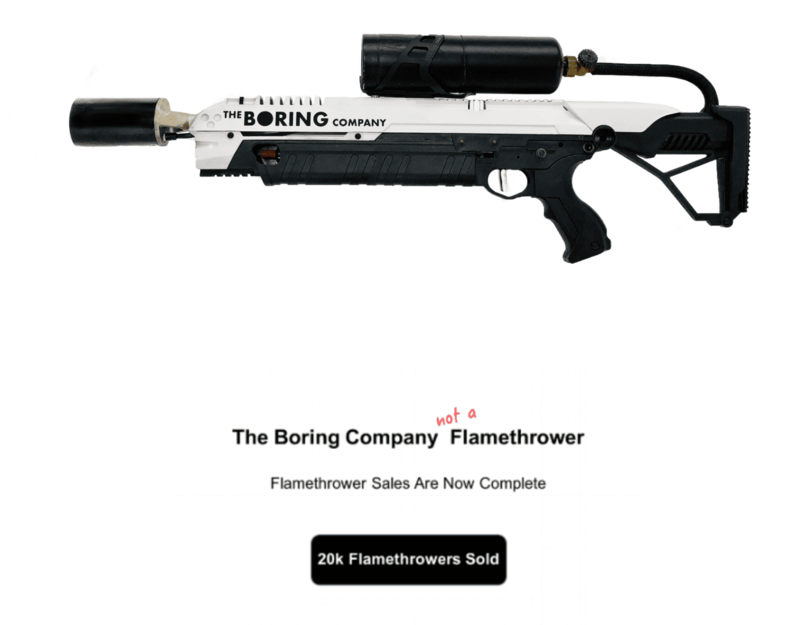 The Verge quickly discovered that The Boring Flamethrower is little more than a roof torch and an Airsoft gun chassis married in some sort of bizarre hybridization and branding exercise, appropriately marked up in a way befitting an Elon Musk product. Roofing torches are typically used for applying bitumen products to roofs, but with some modification, they can shoot more Instagram-worthy streams of flames (up to, but no longer than 10 feet, to satisfy all states’ laws), especially when attached to an impressively sci-fi looking Airsoft gun stock and trigger system. Taken this way, the Boring flamethrowers are indeed little more than a creatively engineered branding exercise, but this shouldn’t surprise any of us. The truth is that these flamethrowers are not going to slay dragons or dig tunnels underneath traffic congested cities. Instead, they’re going to let a bunch of Silicon Valley types who can afford to spend half a thousand dollars on a brand exercise toy take a handful of funny videos for their social media before they never bother refueling their flamethrowers again and they end up collecting dust on their shelves next to their Juiceros and iPhone 8s. But, $10 million is nothing to sneeze at, even if the dust that gathers all over the unused flamethrowers (and the foam emitted from the complimentary fire extinguishers that are inevitably needed for the myriad accidental fires started by these things) are. Maybe Musk will need that purse of lawyer money to defend himself against flamethrower-related injuries. Or maybe it will make a dent in the battle for Los Angeles tunnel digging rights.